As an additional cost to play this operation, forfeit an agenda and spend clickclick. Advance a card X times. X equals the advancement requirement of the agenda just forfeited. The difference between surviving and thriving is successful terraforming. 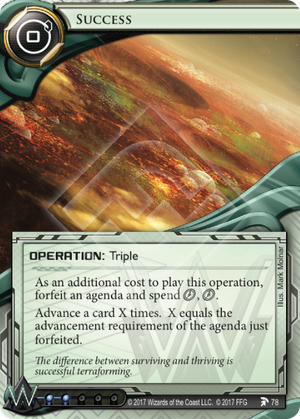 When the Corp plays Success, can they split the advancements among more than one card? If Jemison Astronautics plays Success, which goes first? Jemison or Success? Jemison Astronautics must go first because it is a chain reaction that meets its trigger condition while paying the costs of Success. If the Corp forfeits a NAPD Contract to Success while they have a bad publicity, how many times do they advance a card? The Corp advances a card 5 times. Does the ability on Success trigger the abilities on public agendas? The final Jemison tagline card has arrived, and it is extremely powerful, but unwieldy. The main problem comes from a deckbuilding perspective. The obvious combo is to Sac a 5/3 to Fast Advance a Government Takeover. The issue with that is that including enough 5/3s for it to be reliable and the Takeover does really weird things to your agenda density. Especially because you have to fit in 3x Project Atlas and 3x Hostile Takeover. Okay, 5/3 into Government Takeover is out. What else is there? Well you can already FA a 5/3 from an Project Atlas with Oberth Protocol, so you probably don't want that. Trading a 4/2 for a Vanity Project seems like an alright application, so that's a plus. However the final usage of Success is probably the most powerful and most difficult. You see, Success says "Advances." Not "Place Adv. Tokens." "Advance." This means this combines perfectly with The Public Agendas. Proccing Hollywood Renovation is probably your best bet, but if you really want to get spicy you can Sac a 5/3 to mill the runner's whole deck with Underway Renovation. Hollywood Renovation is crazy though. By saccing a 5/3, that means you get 4 advancement tokens from Jemison(Which always goes first) and 5 from Success, meaning 9 extra advancements to put anywhere on the board. Fire Wall and Colossus Have fun getting through that! Another Agenda- requires Shipment from MirrorMorph, which makes this, (Assuming Biotic) a 4/5 card combo (for three agendas) This needs perfect hand shaping, but Graft and an overadvanced Project Atlas suits this purpose perfectly. This means you get 3 points plus whatever other agenda you installed. I'd say that was a Success!